200 pages | 372 Color Illus. Winner, Euler Book Prize, awarded by the Mathematical Association of America. With over 200 full color photographs, this non-traditional, tactile introduction to non-Euclidean geometries also covers early development of geometry and connections between geometry, art, nature, and sciences. For the crafter or would-be crafter, there are detailed instructions for how to crochet various geometric models and how to use them in explorations. 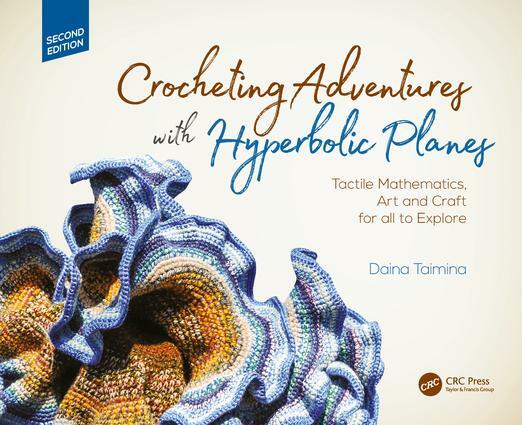 New to the 2nd Edition; Daina Taimina discusses her own adventures with the hyperbolic planes as well as the experiences of some of her readers. Includes recent applications of hyperbolic geometry such as medicine, architecture, fashion & quantum computing. 1. What Is the Hyperbolic Plane? Can We Crochet It? 2. What Can You Learn from Your Model? 5. What is Non-Euclidean Geometry? Daina Taimina was born in Riga, Latvia in 1954--the same year as an International Congress of Mathematicians pivotal to non-Euclidean geometry (as she describes in the Introduction), so her influence on the hyperbolic plane almost seems fated. Now a professor of mathematics at Cornell University, Taimina regularly participates in art exhibitions and educational workshops related to her crocheted models. She was nominated as one of the "Most Innovative People and Organizations in the Science and Technology World in 2006."